A good marketer (marketing manager, trainee, or associate) should possess a certain set of skills and abilities. They interviewers will try to understand if you have them, with the help of behavioral and technical questions. They may also use a simple practical test in an interview with you (asking you to design a simple logo, or to evaluate a simple marketing campaign, or even a complex one), trying to assess your readiness for the job. It also helps them o see the way you think about marketing and advertising, and the way you work on your designs. Let’s have a look at some questions you may get in your interview. What makes you a good marketer/marketing manager/applicant for a marketing position? Why do you think that our company is successful on the market? 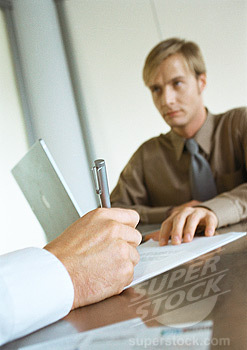 This is our client (the interviewers will show you a product portfolio, or a website). Which marketing channels will you suggest we use to promote their products? Have you ever heard about Guerrilla marketing? What marketing channels are the most effective for [name of the field] business? How would you describe our position on the local market? Can you define the marketing mix? Do you have any hobby? Try to sell me your hobby. Tell me the difference of direct and indirect marketing. Try to sell me your mobile phone. If you should pick one marketing technique or strategy that you consider ineffective, which technique would you pick? You can talk about your creativity, analytical skills, passion for design, or about your past experience with managing and designing campaigns. A portfolio of your best works will demonstrate your marketing skills better than anything else, and sometimes one picture is better than a thousand words. Prepare a portfolio, show it to your interviewers, and explain how your skills helped you to design the right campaigns for your former employer, clients, or perhaps just for your school projects (if you apply for your first job). If you achieved any notable results with your campaigns, do not hesitate to mention them. Try to look at the question from the marketing point of view. You can tell them that they promote their products or services (if you apply for a job in a marketing agency) exceptionally well. You can elaborate on this answer, pointing out the exact details that caught your eye on one of their campaigns. Alternatively you can say that they have a very strong brand (this will always work with big corporations, or with the leading marketing agencies in your city), and that the great results they have been achieving for years on end are their best marketing tool. One way or another, try to praise the interviewers for something. Everyone likes to be praised for their work, and people who lead the job interviews are no different. 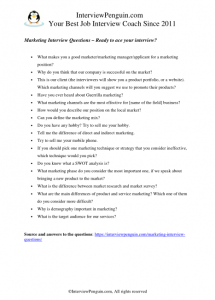 The question tests your working methodology, and your understanding for the marketing business. Try to come up with a real plan, and describe, step by step, how you will identify the target markets, craft the message for the audience, and use the channels to deliver it to your audience. * Do not forget to check also: Body language in an interview. Unless you apply for a job with one of the giant companies, you will have to watch your budgets. Guerrilla marketing is a popular marketing concept originally created by Jay Conrad Levinson, designed for businesses to promote their products or services in an unconventional way with little budget to spend. Try to show the interviewers that you are aware of high-creative low-cost marketing strategies, and that you are aware of the importance of not wasting money for nothing. Type “guerrilla marketing” to Google to learn more about this particular marketing concept. Another question that tests your understanding of the target markets. I suggest you to learn more about the principal clients of your prospective employer, and to study their marketing campaigns, especially those campaigns that are on for a long time. This should help you to understand what works in the target market, becasue if their campaigns didn’t work, they would stop them after running them for some time (typically the testing period). Alternatively you can say that every marketing channel can work for the business, when the campaign is designed in a right way. The research you do prior to the interview will help you to understand their market position, and what they can do to improve their standing on the local market. Regardless of your findings, you should remain optimistic in your answer. Even if they are out of the top ten marketing agencies in the city, you can still say that you like their campaigns, and the way they work in the company, and that you hope to help them to improve their position, to become the local leader. * May also interest you: Marketing Specialist interview questions. The marketing mix is a foundation model in marketing. It has been defined as the set of marketing tools that the firm uses to pursue its marketing objectives in the target. Interviewers may test your theoretical knowledge of marketing with a few questions, similar to this one. You should briefly answer their question, and perhaps give an example of a practical application of this or that thing (with a relation to a real marketing campaign). Job interview is not an exam at school. The more practical your answers are, the better your chances of getting a job will be. This is a classic interview question for marketing trainees. You should speak about your hobby with enthusiasm, and you should show them the benefits, and the emotions they will experience, while devoting their time to the activity of your choice. Good sales talk is a dialogue. Do not hesitate to ask your interviewers some questions, trying to understand what they like to do, and how their personal beliefs, values, and goals relate to the hobby you try to sell them. Example: If you try to sell them an idea of riding a bike, or running in the park, or roller skating, you can ask them whether they’d prefer to lose weight, find new friends, feel better in the evenings, etc. Most people will answer these questions positively. All you have to do afterwards is explaining them, in a simple and attractive way,. how the hobby (riding a bike, running) will help them to attain their goals (new community of friends, endorphins, movement, better metabolism leading to loss of weight, etc). Another question that targets your knowledge of marketing theory. Modern customers are fed up with the ever-present and ever-aggressive marketing messages (billboards, phone calls, SPAM, TV commercials, etc), and indirect marketing techniques are gaining popularity. Show the interviewers that you are aware or indirect marketing strategies (product placement, sponsorship, “fiend” recommendation, brand building, etc), and that you understand their place in the marketing mix. You can also mention the disadvantages of indirect marketing, such as that it can take a long time to see the effects, since indirect marketing relies on relationship building and trust, and that the eventual results are sometimes difficult to measure (especially if you run both direct and indirect campaigns at the same time, which is mostly the case). Google “indirect marketing techniques” to learn more about this subject. A typical question for job interviews for sales positions, but the interviewers may use it also in a marketing interview. Their goal is to see whether you can identify the features and benefits of a random product (can be a mobile phone, but it can be also anything else, such as a notepad lying on their table, or s ball-pen with their company logo), and “transform” them to a marketing message, or to a simple sales pitch. Every phone has some advantages, when we compare it to the competing products, and every phone can bring some benefits to the people who own it. But you should not blindly list the features, such as a good camera, or a great RAM. You should translate these things to the language of the customer, so they can understand how owning the phone will make their lives better. For example: A huge RAM means that the phone is fast, the applications load quickly, and the user will save time while working with the phone. An excellent camera will allow them to capture the precious moments they experience with their family and friends, on a good quality picture. Cold calling is a good answer for most industries, but you can also say that it depends on the product and the campaign, and that each technique can be applied with some success, if marketers know what they are doing. 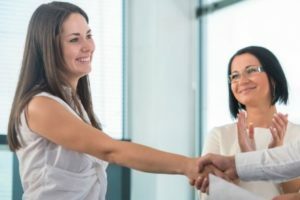 Show the interviewers that you believe in your skills, that you do not cast aside any marketing technique, just because most people can’t use it effectively. Do you know what is a SWOT analysis? What marketing phase do you consider the most important one, if we speak about bringing a new product to the market? What is the difference between market research and market survey? What are the main differences of product and service marketing? Which one of them do you consider more difficult? Why is demography important in marketing? What is the target audience for our services? Apart from the technical questions, you will have to answer some behavioral questions, and you will have demonstrate your marketing skills, while dealing with a practical exercise. The behavioral questions address your attitude to various work-related situations, such as experiencing pressure in work, having a conflict with a colleague, failing to achieve your target, struggling to get your message over, etc. Since we all experience these situations in work (everyone experiences success and failures, friendships and conflicts, deadlines and pressure), these questions do not significantly differ from one interview to another. Have a look at the most common behavioral interview questions. As I mentioned earlier, the interviewers may ask you to design a simple work (logo, slogan, a simple marketing campaign). They can actually assign the task to every job candidate (everyone who submits the application and meets the basic job criteria), and they can do it even before the start of the interviews. 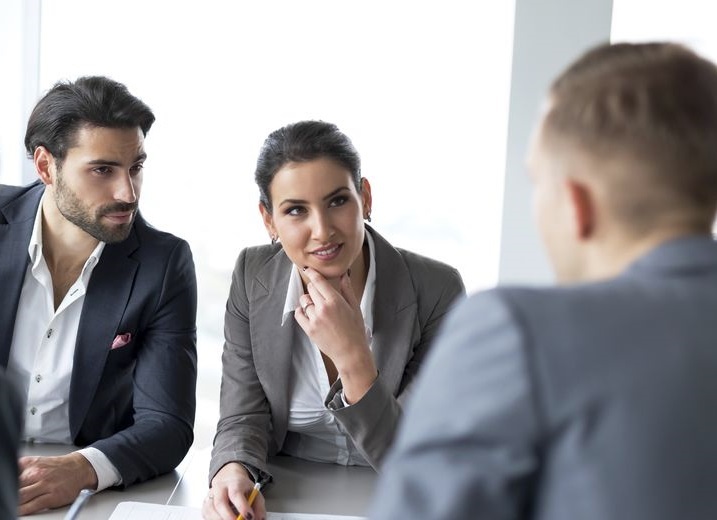 This practice helps the HR managers to screen out the people who are not really serious about the job opportunity, since these people will refuse to do the task, or they won’t complete it in time for the interviews. Prepare for all challenges – behavioral questions, technical questions, and a practical test, and succeed in your interview. We wish you good luck! Sales interview questions – Good salesman is always a decent marketer (or a great one). Learning something about the sales interviews, or sales in general, will help you to succeed in your interview for a marketing position. Body language in an interview – What do your gestures and movements say about you? Can we control our non-verbal communication? Everything you need to know about your body language in an interview.